“The fluffy texture was so good and the sweet sugary crunch in my mouth with the light fluffy cheesy frosting was one of the best things I have ever had in a cupcake.” This was the honest, but oh so sweet description that I received from my 11-year-old daughter after trying the Berries on a Cloud cupcakes. I think she said it best. 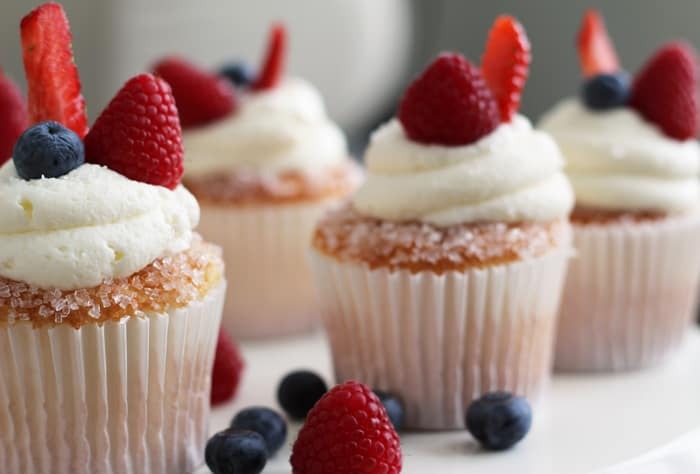 This Berries on a Cloud cupcake recipe is so easy to make too. The cake starts with a light angel food cake base, then there’s the crunchy sugar crystals layer… have I got your attention yet? Then add a super light and perfectly sweetened mascarpone frosting and finish it off with fresh raspberries, blueberries and strawberries. Yep… you truly have THE PERFECT CUPCAKE. It’s heaven on earth people!! 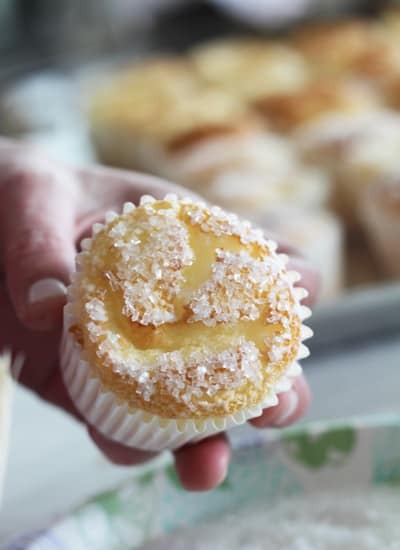 I created this cupcake recipe for my first ever housewarming party cake and let me tell you…the guests were begging me to email them the recipe right away even though I told them it would be posted on the blog soon. 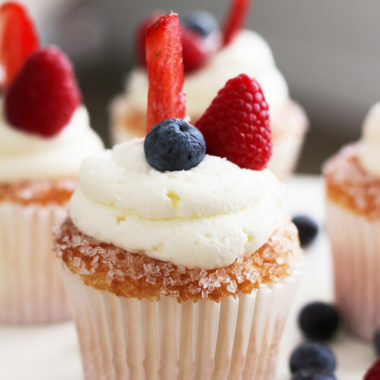 My husband…who literally hates all cupcakes LOVED this Berries on a Cloud cupcake as well. In fact here is his quote about it…“Buddha got enlightenment from sitting under a tree. I got enlightenment from eating this cupcake.” Yeah, my husband is a character, I know. Now, just like my family, every time you hear a little crunch or see a sweet fresh berry you will crave these delectable delights! Preheat oven to 375 degrees. Make your Angel Food Cake recipe per the directions on the box by adding the water and beating for a minute. Line your muffin tin with muffin liners (I prefer the jumbo muffin liners in my regular muffin tin as the angel food cupcakes rise higher and look better this way.) Fill the muffin liners about ¾ the way full with batter. 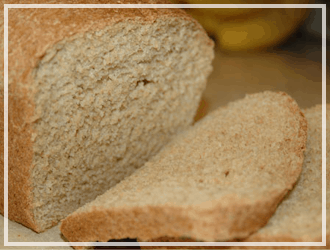 Bake for 12 – 15 minutes until cracked, golden and dry to the touch. Do not under bake these cupcakes or they could fall flat. Allow cupcakes to cool. Add ¼ cup heavy cream to small bowl. Add the whole container of decorative sugar crystals to another small bowl. Do a test first. 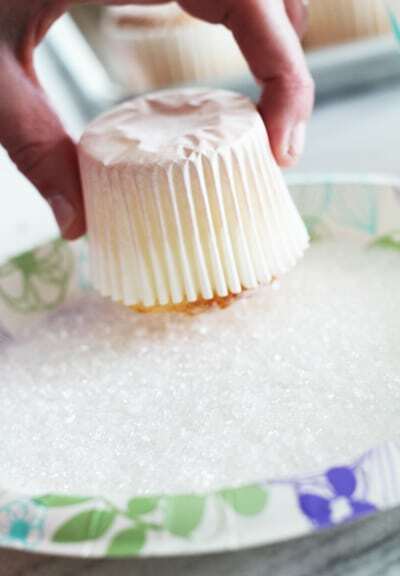 Dip a cupcake directly into the sugar crystals and see if they stick on. If they do you can avoid having to use the pastry brush method with the cream. 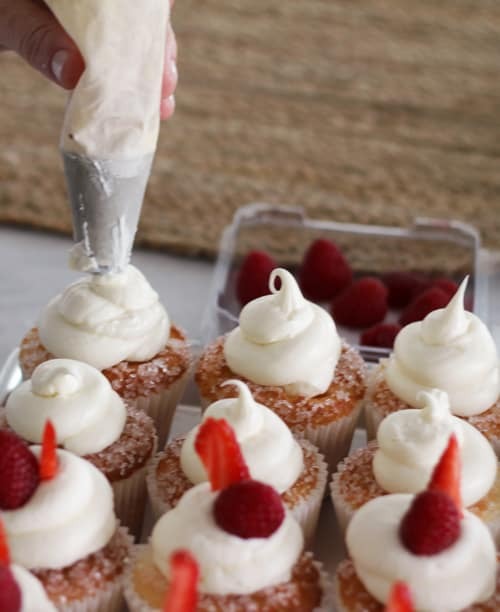 If the crystals don’t stick you will have to take a pastry brush and brush a small amount of cream onto a cupcake all around the tops and edges. When I say brush, I mean lightly. Imagine you are painting a delicate watercolor. Avoid the sog-monster with light easy brush strokes. Dip the wet cupcake top into the sugar crystals making sure to get some on the outside edges. Do this one by one to each cupcake. After that, it’s frosting making time. 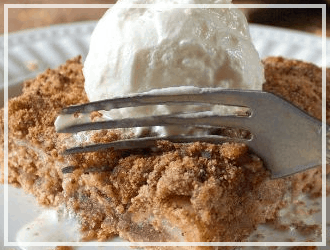 Take a chilled mixing bowl and beat on high the remaining 3 cups of heavy cream and almond extract until soft peaks form. In another bowl beat together the softened cheeses and powdered sugar until smooth. Then fold the cheese mixture into the whipped cream mixture gently until well incorporated. 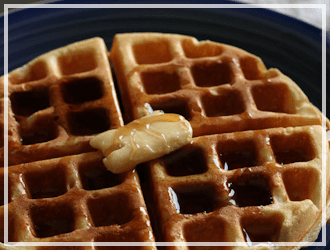 I am so glad that I have my Frigidaire Gallery All Refrigerator for big recipes like this. One of the best things about it is that the freezer trays are interchangeable with the fridge trays. 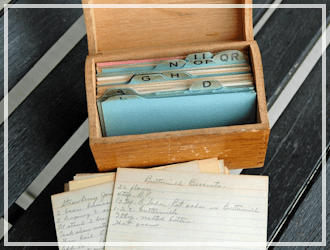 So, there is no running out of storage space! 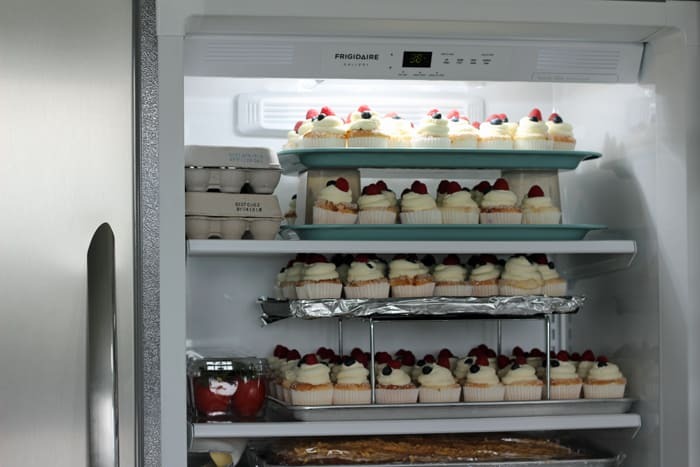 When I had parties in the past I had to use a second fridge that I kept in the garage to chill my bowls and extra appetizer trays. Now everything I need fits right here in my kitchen. The days of running to the garage for our back up trays of yummy goodness are no more! 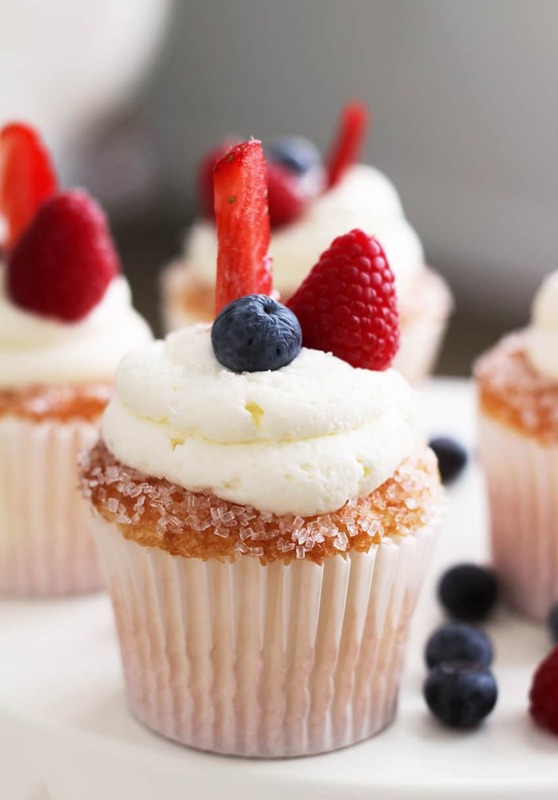 Berries on A Cloud Cupcake are so easy to make and delicious! Preheat oven to 375 degrees. 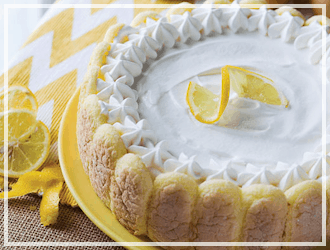 Make your Angel Food Cake recipe as if you were making the angel food cake recipe on the box. Line your muffin tin with muffin liners (I prefer the jumbo muffin liners in my regular muffin tin as the angel food cupcakes rise higher and look better this way.) 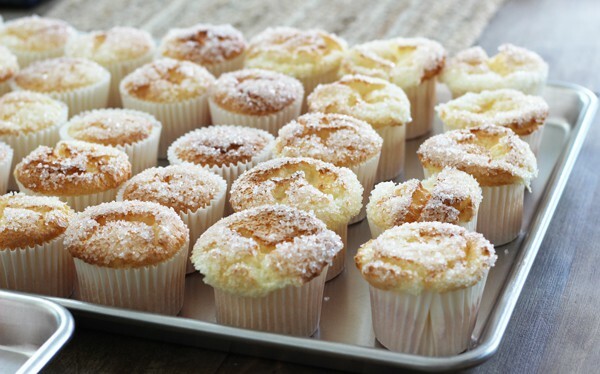 Fill the muffin liners about ¾ the way full with batter. Bake for 12 – 15 minutes until cracked, golden and dry to the touch. Do not under bake these cupcakes or they could fall flat. Allow cupcakes to cool. 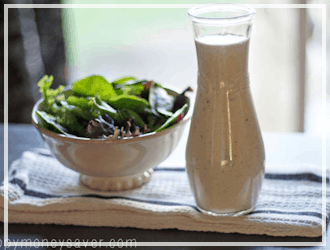 Add ¼ cup heavy cream to small bowl. Add the container of decorative sugar crystals to another small bowl. 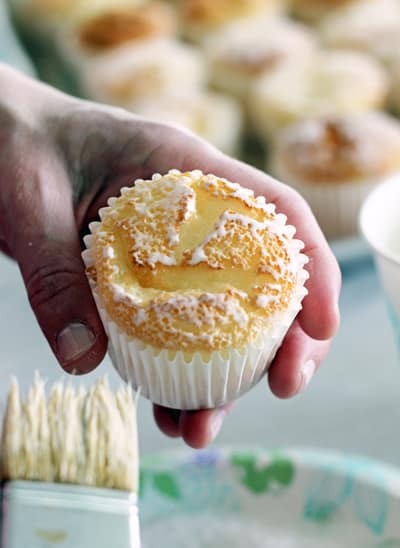 Take a pastry brush and brush a small amount of cream onto a cupcake all around the tops and edges. Dip the wet cupcake top into the sugar crystals making sure to get some on the outside edges. Do this one by one to each cupcake. 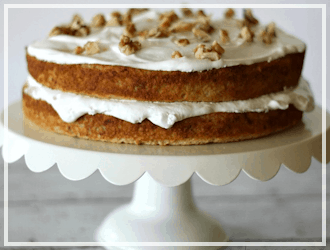 To make the frosting take a chilled mixing bowl and beat on high the remaining 3 cups of heavy cream and almond extract until soft peaks form. In another bowl beat together the softened cheeses and powdered sugar until smooth. Then fold the cheese mixture into the whipped cream mixture gently until well incorporated. Add to large piping bag if you have one (squeeze frosting out on cupcake in a circular motion to make it look cloud-like.) Then add raspberries, blueberries and a slice of strawberry as desired. Lastly a little more sugar sprinkled on top adds a decorative touch as well. Chill frosted cupcakes in refrigerator until ready to serve. 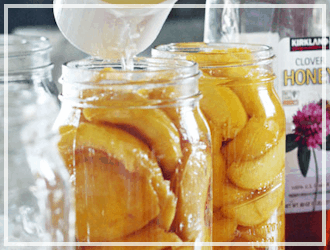 Can be made up to 2 days in advance if kept cool in refrigerator. 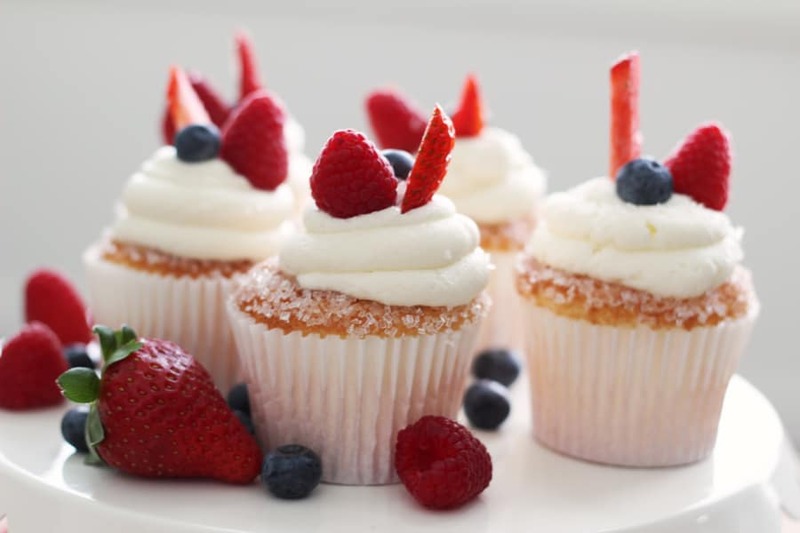 I hope you enjoy this Berries on a Cloud cupcake recipe as much as I do. Happy baking everyone!! Sweet! Make sure and come back and tell me how you liked them!